Our speaker will be Julie Wilson. What types of records are created locally and kept at the Courthouse? There are various types of index systems used - they are not all the same. Come join us to learn/review about the various types of indexes and tips to help you locate documents. Join us for a presentation on Obituaries. Our speaker will be Edward Bolte, President WRHS Genealogical Committee. Our speakers will be Jeanne Peugh, Director and David Peugh, Assistant Director of the Family History Center in Tallmadge. Judy Jennings is a member of the DAR and helps people with the application progress for joining the DAR. Judy will discuss researching your Revolutionary Ancestor and provdie helpful hints to get past roadblocks in the research process. She will also talk about the on-line application process. Our Vice President, Mary Ann Horak will lead us through her own "Who Do You Think You Are?" style journey. Interesting ancestors and forgotten stories were uncovered. Mary Ann will share what she discovered and some of the research tools she used. The presentation will introduce (or refresh) members to the online research options available through the library websites. We will meet at the Main Library in Computer Lab 1 on the 1st floor. Our speaker will be from the Special Collections Department. Our presenter will be John C. Fazio, Civil War Scholar. John will present a story of a Union and a Confederate General and their wives and how they became intertwined. Our presenter will be Mary Jamba, a Ohio Genealogy Society trustee. Our speaker will be Julie Wilson. Julie will talk about autosomal matches and provide tips for working with them. Our presenter will be author Barb Baltrinic. Barb will present the story of Andrew Clark who was captured and placed on the British prison ship H.M.S. Jersey. Overview of resources to search immigration records over different time periods. We are pleased to have our speaker from September, Liz Pearson, returning this month. Liz will continue the conversation on administrative jurisdictions, parish chest records, and the government census. Our speaker will be Liz Pearson. Her specialty is English and Welsh research. Her presentation will be the Fundamentals of English and Welsh Family History Research. This presentation will provide all you need to know about easily accessible family history records. What records are available and what records are not available. Liz will cover administrative jurisdictions, parish chest records, and the government census. Our speaker will be Julie Wilson. Julie will cover how the results from 3 types of dna tests might be used in your research and help connect you with other researchers. Join us for this informative presentation. Kelly McKnight, our Cemetery Chair, will announce the location of our annual cemetery invasion at a later date. Our speaker will be Cheri Goldner, Librarian from Special Collections at the Akron Main Library. She will tell us how to make the most of using the Find A Grave website. Our speaker will be Debbie Abbott. The WPA ran from 1935-1943 putting unemployed people to work on public projects. Debbie will guide us through the records created duing this time. For our Brick Wall meeting this year will be working in small groups. Do you have a Brick Wall or are you new to genealogy? Bring your research problem and we can point you in a new direction for research. Join us for a presentation by Rebecca Larson-Troyer on the tips and techniques for dating and analyzing your family photographs. Please join us for a presentation by Barb Baltrinic. Barb used her ancestry to write a book entitled,"A Founder for All". The story of Abraham Clark - SIgner of the Declaration of Independence. Our speaker will be Margaret Cheney speaking on "Serendipity in Genealogy". 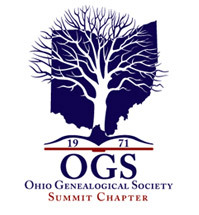 Our speaker will be Mary Milne Jamba, who is president of the Greater Cleveland Chapter of the Ohio Genealogical Society. She will talk about “Finding Your Family: Tips, Tricks, and New Techniques to Maximize Your Results While Searching On-line for Your Ancestors”. This month we will tour the Polksy building and our guide will be telling us about the holdings in this building. These holdings are the in the repository of the University of Akron. Our cemetery invasion will be back at the Northfield-Macedonia cemetery where hopefully we can finish our mapping of the cemetery. We hope you will join us. We will be there from 10AM until at least 1 PM or until we are finished. Our speaker will be Julie Wilson. Julie will cover the 3 types of dna tests that genealogists use, how the results might be used in your research and help connect you with other researchers. Also covered will be the testing companies available and what resources those companies provide in working with your results. Join us for this informative presentation. Please join us for a presentation by Debra Lape entitled,"Looking for Lizzie - A True Story of an Ohio Madam". Our speaker will be Judy James, Manager of Special Collections at the Akron Main Library. Judy will tell us about all of the exciting new information available in Special Collections. Our Brickwall meeting this year is going back to the basics. What clues are in the documents we already have. What alternate records exist which might help in our search. What tools would help us. What about the FAN network (friends, associates, neighbors)? Julie Wilson will share some basics. Jane Gramlich, libraian in Special Collections, will present "Ancestors Before 1820" Please join us for this presentation..
Tom Neel, Librarian for OGS, will be our speaker. He will be speaking on "Clues to Your Ancestors in the Newspaper". The speaker for this presentation is Julie Wilson, our treasurer. Indexes are the key to finding records whether searching at the courthouse, using microfilm or digital images. Julie will give examples of multiple types of deed indexes and various other indexes you might come across when researching. Plus tips to help you get the most out of your search. Carla Cegielski will talk about "The DPLA: Digitalizing America". The DPLA has been described as a Virtual Library of Americana that's Free and Accessible to All. Learn to navigate the site and identify relevant resources. Carla is a professional family history researcher specializing in Ohio and West Virginia research. She has been researching her own family for over 35 years and providing services to others for 13 years. We will all meet at Northfield-Macedonia cemetery at 9 AM and read the stones in that cemetery. Once the cemetery is completely read, we will publish the information. NOTE DATE CHANGE! We will meet at the OGS library in Bellville at 9AM or whenever you get there to do research at that facility until they close. If you need instructions on how to get there, contact MarilynAGill@gmail.com. Mary Plazo. librarian with Special Collections at the Akron-Summit Public Library will speak on Wills, Old and New. Jane Gramlich, librarian in Special Collections at the Akron-Summit Public Library, Main Branch will speak on "Immigrants Prior to 1820". The subject of this month's meeting is "Brick Wall Breakers". We will discuss various methods used by others to break their brick walls. Perhaps those suggestions will help you break your brick walls. Send your suggestions as to what you would like to discuss to marilynagill@gmail.com. Put "Brick Wall" in the header. We will also have a swap at this meeting. Bring those genealogy magazines, books or other items to the meeting. Perhaps someone else can use them. We will have a table to put them on. Ms. Sharon Myers will be our speaker. Worse than Andersonville, the Jersey was a floating prison in the North River of NY. Learn how in January of1783 the British captured the American South Carolina. During the first half of the 19th century bones of nearly 12,000 American men who were imprisoned on the ship washed up on the banks of the Brooklyn Shore. Ms. Lauren Landis from the Stark County Public Library will be our featured speaker. Come join us and learn how to improve your searching techniques when you are using Ancestry.com!! The June 21 SCCOGS regular meeting will be held at the Akron-Summit County Library on High Street in rooms 2A-2B at 1:30 for the regular member meeting. The program for the meeting will be Mr. Paul Goodwin who will give a presentation on: “The History of the Ohio & Erie Canal.” Mr. Goodwin is an amateur canal historian who has studied the Ohio and Erie and other canals for about 45 years. He leads bicycle tours on the Ohio and Erie towpath and narrates canal related theme rides. Our Cemetery Chair, Kelly McKnight, will lead us in our annual Cemetery Invasion. We will read the stones in the cemetery or portions of the cemetery and hopefully we can finish this one after several trips over the past few years. Instructions and materials will be provided. Our work will provide the information for a new publication for our Chapter. Bring your lunch, lawn chair, wear comfortable shoes and come enjoy the day! There will be no formal speaker. We will discuss member research and questions you may have about your research. Please come prepared to participate and give suggestions based upon your experience. The goal is to help those who have questions. You have asked for this program. Please bring any give aways to this meeting. We will have a swap table set up. Charles "Chip" Billow from Billow Funeral Home will discuss "Funeral Home Records: There is no "standard" and he will provide an update on Ohio's EDRS - Electronic Death Registration System. Julie Wilson and Marilyn Gill will talk about what is available on the chapters website for members and non-members. Everyone is invisted to attend. Meeting will be held at the main branch of the Akron-Summit County Public Library.